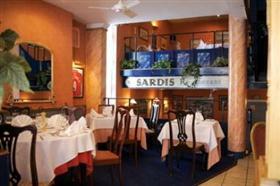 Sardis Restaurant opened in North Road, Darlington in 1987. Owned and run by Sardinian brothers, Salvatore and Francesco Obinu, it specialises in classic Italian cuisine but also offers dishes with Mediterranean and European influences. A separate vegetarian menu is also available. As previous winners of the regional Italian Wine List of the Year Award, Sardis offers an extensive and impressive wine cellar.